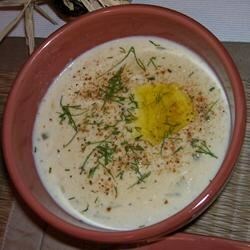 "This lovely crab bisque is simple and quick, and absolutely delectable! Garmnish with chervil or parsley. Enjoy!" See how to make a super-simple, guest-worthy crab bisque. I love this recipe! I have made it for my family several times and my in-laws request it over and over. They love it. I double the amount of crab and add Old Bay seasoning. Added 1/2 cup of wine along with the milk/cream and let that cook down a bit. Then added the other 1/2 cup of wine with the crab meat. It was perfect. This is a must keep in our house. Great soup, I added 3/4 tsp old bay seasoning as suggested and 2 Tsp of tomatoe paste for a pink color for presentation. Adding a little Zatarain's Creole Seasoning made it very good.